I have been greatly blessed by my Father in Heaven throuout my entire life. He has cared for me and watched over me. I have felt his divine influence more times than I can count. The purpose of this autobiography is to record for my children and grandchildren some of these great blessings. My first great blessing was that of my Mother. I was born February 21, 1932 in Salt Lake City, Utah. My Mother was Flora Elizabeth Salm and my Father was Curtis John Butts. I had one sister Norma, and one brother David. I also had two step brothers which my father brought with him from a fromer marriage. They were about 10 years older than I. They were Vernon and Curtis Jr. My mother , however was the greatest influence of my life. Her care and nurturing was incredible. I will always remember her taking me on her lap with my brother David in the big chair in the living room. It was here that we both learned a value system in those early childhood years. One of the things I remember most was an event that happened when I was about three. It was in the middle of the great depression. My parents had planted a big garden. I was helping them one day in the spring time. They sent me back to the house to get some seeds which were on the table. They said, Put them all in a big sack and bring them back out here to us. I went to the house and saw all these packages of seeds. I could not find a sack, but I did find a big empty corn flake box. Finally my father came to see what was taking me so long. When he saw all his precious seeds mixed togeather, he became terribly upset. There was no way they could be seperated. There was just no money to buy more seeds. I thought he was mad becuase I had used a corn flake box instead of a sack. When I was eight, my father died in an automobile accident. Even though I was not close to him because he was gone most of the time, I remember what a terrible emotional time I had. I had to watch my sister and two older brothers go through terrible grief, as he did establish a close relationship with them. My mother had to go to work and she became both father and mother to the family. The war was raging now. My two brothers had gone off to war. Mother tried her best to take care of , the needs of her family. It was hard for her, but she never gave up. When I was 16, my mother gave me some scriptures for my birthday. She wrote in the fly how they would help me and be a guide to me. She told me about the wonderful feelings of joy she had experienced from reading the scriptures. I had heard the same thing in church and in my seminary classes, but I couldn't really see any "joy" from reading the scriptures. In fact, all I could see was that they were very boring. This worried me. I was also worried because I couldn't seem to feel at ease around boys. I had acne and I couldn't seem to control my eating habits. All of these things are typical teen problems, but to me they were very real. I decided to pray about them. My Uncle Alma had taken me on a camping trip to Quincy, Calif. We camped near the Middle Fork of the Feather River. One morning I climbed the mountain and prayed to my Heavenly Father that I get some answers to my problems. Suddenly I was overcome with the most spiritual feeling I had ever experienced in my life. I could no longer remain on my knees, But had to sit on the ground. I was told that I would have help with my problems and that this would continue all my life if I would keep the commandments and pray. I knew beyound a shadow of a doubt that there was a God. I have never doubted since this wonderful occurrence. I have made mistakes. I have sometimes strayed, but I have never doubted his love for me. I came from the mountain and opened up my scriptures. suddenly, everything was clear. I felt that those scriptures were written just for me. I understood and I felt the love of my Heavenly Father coming through those scriptures. I knew now what my mother was talking about. It was at this time that I picked up the habit of underling in red those scriptures that had special significance to me. I had also prayed that some day I would be able to live in Quincy. Sure enough, some 14 years later, my husband was transferred to the town of Quincy while working for the railroad. We have lived here ever since and he is now retired. at 16 I quit school and married. This marriage lasted 3 and a half years and failed. Most of it was because we were just too immature to maintain a marriage relationship. After my divorce, I returned to high school and graduated with a scholarship to Brigham Young University. I was planning to go to college, but I met and married Daniel Crawford Roberts instead. We were Married april 9, 1954. Of this marriage wer born 9 children. These Children have all been worth while people. They earn their own way since they have been about 12. They got paper routes, mowed lawns, baby sat and worked to buy thier own clothes and pay their way to college and as missionaries. I am very proud of them. 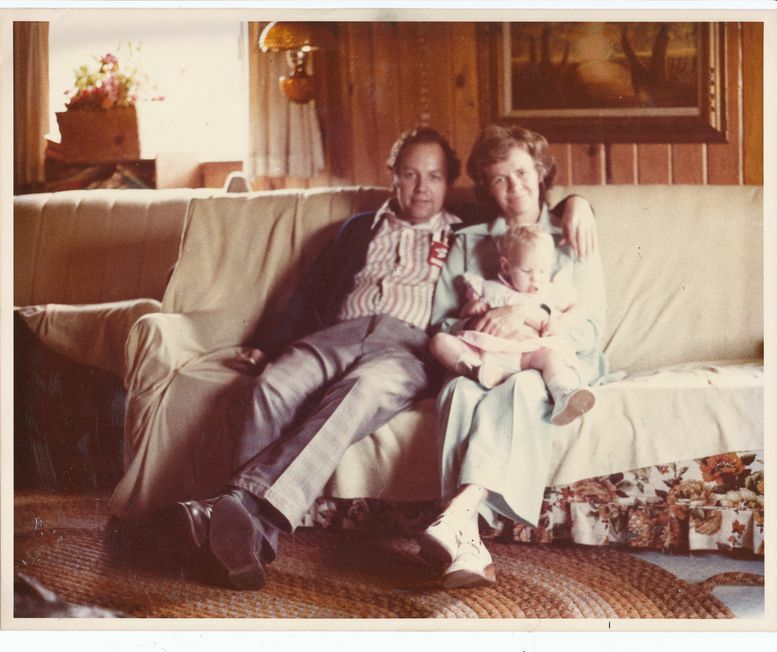 Not shown Flora Include Dale Jorgenson who lived with us. They are independent and self supporting. They are ambitious and have good moral standards. they are all active and responsible member of the LDS Church except David. He quit going to church when he was 18, and has chosen not to have anything to do with any church. Hi is, however, a good worker, responsible, and very close to his brothers. There is not much that he will not do for them, or for me either. Life was very hard raising these children. We were very poor. There was just not enough money to go around. I tried to help by taking in foster children sometimes, but that was very hard, too. Crawford worked nights and could not sleep at home during the day. He got his own little place and slept there. this was necessary so he could support the family, however, it was hard for me to raise all these children alone. I got help. Ofter my Heavenly Father came to my aid in answer to prayer. I remeber I decided that 6 children were enough. I was exhusted. There were marriage problems. Some of the children had learning problems. There was no money, and we had bills galore. Crawford told me one day that he felt inspired that more children were waiting to come to our home. I told him to "Leave his old visions to himself!" He suggested that I pray about it myself. This I did. I also fasted every sunday for about four months. One Sunday we went to get my oldest daughter's Patriarchal Blessing. In the blessing she was told that she had chosen to come to her parents. The thought came to me. "what if someone else has chose to come to me? what would I say to them if they said," I wanted you to be my mother, but you didn't want me.!" That night I had a very real dream. Two littl babies were laid in my arms. A little boy and a little girl. I woke up immediately and knew that the Lord had answered my prayers and fasting. a year later Little Matthew was born. A year after that Mary came to our house. Perfect little children that have been nothing but a blessing. I cannot thank the lord enough for these children who did not add to the problems, but indeed provided some of the solutions by their willingness to work at the problems in our family by helping out other members who had difficulities. Flora was another blessing. I had decided again that our family was complete after the birth of Mary and Matthew. One day while I was out in the woods praying and studying my scriptures I heard a voice as plain as can be calling "Mama." I thought it was a bird or a squirrel. Then the thought hit me that perhaps it was yet another child calling me, as if to say "don't forget about me." I prayed if this was the case that I would hear the voice again. Sure enough, I heard the little voicecalling "Mama" again. I was now well over 40, yet little Flora came to join our family a few years later. another perfect little girl who was nothing than a blessing. Unfortunately, she was not meant to stay with us. Before she was two years old, she died in a terrible fire. our house was destroyed in the process. I felt like I no longer wanted to live. The depression was terrible. a year later I was still having terrible nightmares. Our Relief Society President came to see me and tell me that she had prayed and felt inspired to tell me to turn my life in another direction. She said I should go back to school. I decided that she was right. I did go back to school and earned my teaching credential. I also took up running every day. This helped my mental attitude. I overcame my depression and turned my life in another direction. I am now teaching school and work with Special Education children. This is a real challenge, but it has brought new meaning to my life, and I again feel like God has blessed me and watched over me. I am an environmentalist. I have done much to help legislate the Buck's Lake Area being made a wilderness area. I am active in Boy Scouts of America as well as the girls camping program of the LDS Church. I use the beautiful area around me to educate the children in my charge about the balance of nature and how important it is to preserve it. The three-day pack in trips I take several times each summer are a great joy to me as well as the young people I take with me. During these trips in the solitude of the mountains I write poetry. One of thes poes is enclosed. We work for the forest service donating our time to clean the forest service thousands of dollars. Again, my life has been one of great blessings. My health has been good. I was blessed with the most wonderful mother in the world. I have had 9 wonderful children who have brought much joy to my life. Most of all, however, I have felt and enjoyed the blessing of God and know of his presence.